Combining easy programming, pinpoint accuracy and digital controls provides both comfort and energy savings. 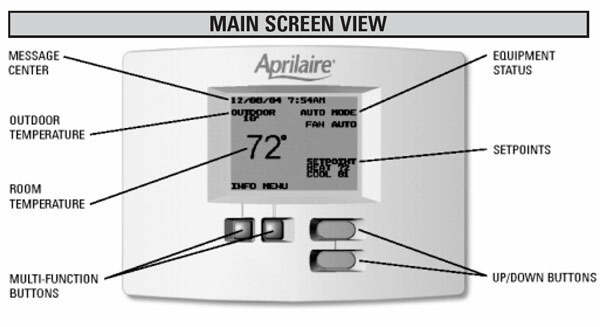 Aprilaire®'s Programmable Thermostat offers temperature accuracy and comfort control. An easy-to-read backlit display and intuitive programming make it a cinch to use. Friendly, non-intrusive service reminders ensure an efficient and consistently comfortable indoor environment. Aprilaire®'s Programmable Thermostat is pre-programmed with Energy Star® settings, and it automatically adjusts for daylight savings time. The large main display assures you can easily view set points, outdoor/remote temperature, fan status and the network communications at a glance. The main display provides all information about the comfort settings and current conditions, including: room temperature, mode of operation, heat/cool set points, Fan ON or AUTO, remote or outdoor temperature (with optional sensor), relative humidity (with optional sensor) and more.